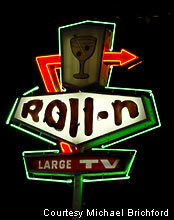 This neon sign for Roll-n sits outside a Houston, TX bar that's been around for years. 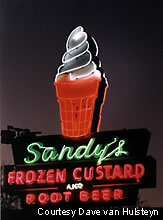 Sandy's Frozen Custard is a great place to stop for a snack or late night refresher. Hut's Hamburgers, which is next door to Favorite Liquors, features great food and an even better building. The streamline deco look appears to be from the 1920's. This place may have once been a gas station. 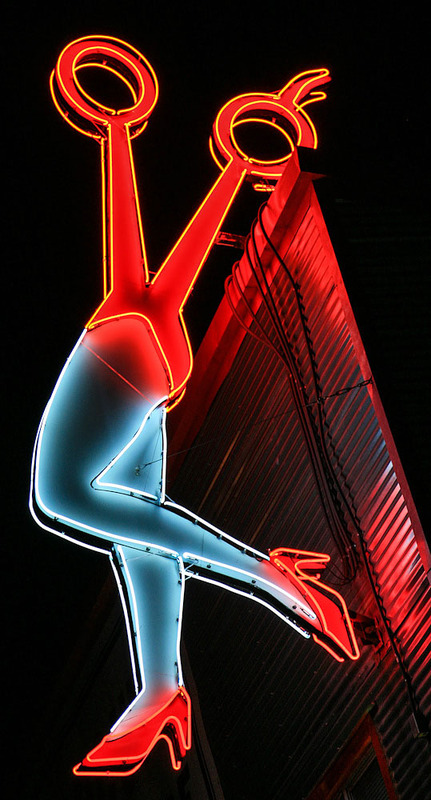 The Frisco Restaurant and it's good lookin' neon is rumored to have been a favorite of LBJ's. Not sure what Ladybird Johnson thought of the sign though. The Gypsy Tea Room is worth a visit if only to see the classic neon sign in front. Check out the detailed lettering on this sign. El Chico advertises its fine foods. The man on the marquee looks rather mysterious with the grin. 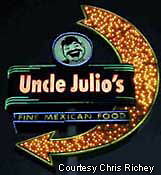 Uncle Julio's restaurant advertises its "fine Mexican food." The beaming face atop this marquee supports this statement. the sign has an interesting smile. 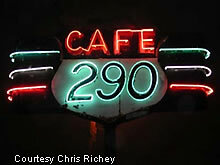 The Cafe 290 of Austin, Texas features a sign all aglow in neon.